This is a photo of a double rainbow over Salinas. I was in the backyard visiting my doggie in prison Zorrita, who is locked behind a fence because she was fighting her sister Dorcas. I was petting and hugging my puppy when I saw this, and I snapped a few pictures. Delight’s Puppies’ First Time Outdoors. Delight Doggg is out standing in her field at Casa De Verde. 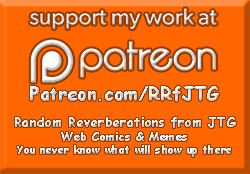 Random Reverberations from JTG (RRfJTG) is more than a meme and not quite a webcomic. 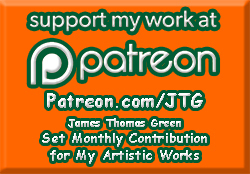 I JTG create random bits of art, wisdom, sillyness, and more and less. I use my own photography, artwork, public domain art, quotes, and such in my creative process. Periodically, usually on Throwback Thursdays, I will post a classic photo of myself. I try to put out five strips per week, Monday through Friday, but sometimes I will add extra strips on Saturday, Sunday, or an extra weekday strip when current events happen. Thank you for reading my tidbits, and if you like these strips, like me to keep making these strips, or just like me, please support me on Patreon.